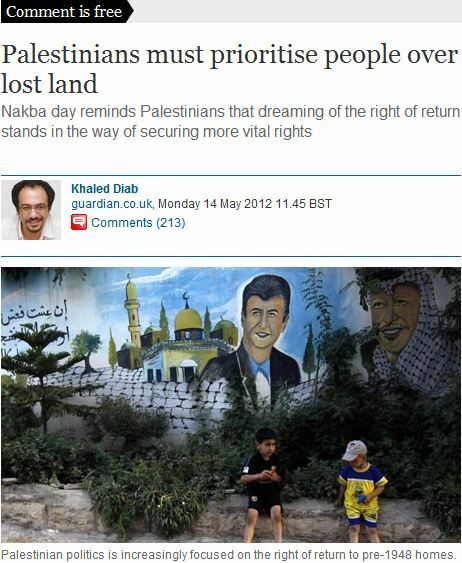 The general premise of Diab’s ‘Comment is Free’ essay sounds fair enough, titled “Palestinians must prioritise people over lost land”, with the sub-title “Nakba day reminds Palestinians that dreaming of the right of return stands in the way of securing more vital rights”. “Perhaps few recall it better than my Palestinian neighbour, a sprightly great-grandmother who turned 90 this year. Born at the start of the British mandate to a prominent Jerusalem family, she gave birth to her second child just months before Israel’s declaration of independence. At first, she and her family were determined to stay put during the civil war that broke out following the UN vote to partition Palestine. Deir Yassin is one of those “clashes of narratives” that are at the root of Palestinian hostility towards Israel, and which will never be agreed upon by both sides. The article points the reader to the Wikipedia entry for Deir Yassin but one can gain a much more balanced understanding of the event from the Jewish Virtual Library. This above paragraph really encapsulates the whole Palestinian “right of return” issue. The family fled due to their own leaders’ propaganda, but managed to return to “just a few miles from their former home”. In this case, why are they still considered refugees? It does not mention descendants inheriting the refugee status ad infinitum. And as proof of Israel’s compliance with this article, Diab’s grandmotherly neighbour herself, back in East Jerusalem, is but one confirmation of this fact. Diab further relates how the Palestinian demand for “right of return” has taken over their political process but comes to the correct conclusion that this is a loser’s game. “But at a time when the dream of Palestinian return is perhaps more distant than ever, and more and more Palestinians are being pushed off their lands by Israel, why are so many focusing on what to much of the rest of the world seems like a futile quest? Diab’s recitation of Israel’s “crimes” is repeating the failed propaganda exercise of the Palestinians’ early leaders in 1948. There is no “aggressive expansion of Israeli settlements” since no new settlements have been set up since the mid-1990s. Any new settlement building is done within settlements’ boundaries, and therefore does not encroach on any further land. Further, Diab’s reference to what he characterizes as Israeli “Nakba denial” necessarily evokes “Holocaust denial”, a hyperbolic and completely unserious historical comparison. As for Israel’s “insistence” on the Law of Return, that is a direct outcome of (and reaction to) 2,000 years of persecution throughout the world, both in the Western Christian world and the Eastern Moslem world, culminating in the Holocaust. If Israel were to be overrun tomorrow, 6 million Jews would be easy prey with nowhere to go, and politically persecuted Jews in the diaspora would, once again, have no place to take refuge. Perhaps the starkest example is Lebanon where, on the back of fears of upsetting the small country’s fragile sectarian balance, some 400,000 Palestinian refugees, many of whom were born in Lebanon, are deprived of numerous basic rights – including citizenship, public healthcare and access to numerous professions – and forced to live in what are effectively ghettos, otherwise known as refugee camps. Jordan has done more than others to integrate dispossessed Palestinians by granting most of them citizenship but, even there, Palestinians still face a certain amount of discrimination and some of them have been made stateless again. I would say that it’s about time an Arab commentator stated this clearly. This co-opting of Jewish methods for mourning, commemorating the Destruction and Diaspora, and the 2,000 year-old Jewish wish to make “Aliyah” suggests a determined effort to construct a historical understanding necessary to one day supplant the Jewish nation itself. Furthermore, with the innocuous little phrase “a land with two peoples”, Diab has managed to slyly insert a “one-state solution” proposal by the back door. This does not bode well for a future of peace and co-existence. Diab is correct that the Palestinians must let go of their insistence on “right of return” because it is recognized as a non-starter. He is also very right in drawing attention to the miserable treatment the Palestinians receive at the hands of their brethren. However, aiming for a one-state solution will not bring the Palestinians any closer to a state of their own. Who’s afraid of Richard Millett?